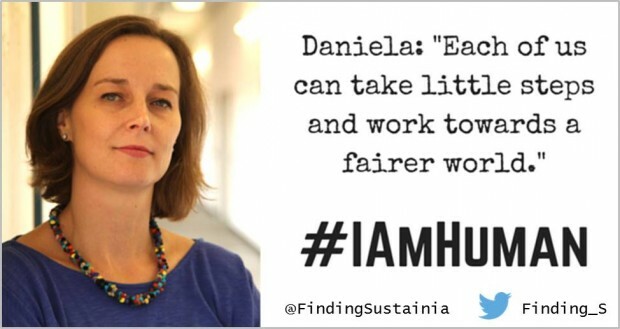 #IAmHuman – Daniela: Each of us can work towards a fairer world. My name is Daniela. I am human. I was born in Mexico, a wonderful country situated “so far from God, so close to the US”, to quote Porfirio Diaz. My grandparents left Europe – Austria and Germany – some before and some after World War II, in search of a new life in a part of the world they had no clue about, and in which people spoke a language they had never heard before. They travelled by ship, taking only the bare minimum with them, and started a new life from scratch. It was most certainly hard for them, and I guess they kept missing their home country as long as they lived. My parents grew up bilingual and bicultural (my mum in Argentina and my dad in Peru), and I’m grateful that I also grew up that way. And of course, my 4-year-old son already speaks Spanish and German fluently and feels at home both in Mexico and Germany. In some ways, it was funny and weird to grow up with German traditions in Mexico. Some of my Mexican friends used to make fun of our “shout-language” at home. At the same time, they looked forward every Christmas season to the German Christmas cookies we baked for days and days and handed over as special gifts to our friends and acquaintances. And when I moved to Germany as a student, I sometimes stood out because I didn’t know some German manners, ways of jesting or even TV shows. These experiences, as well as my physical appearance, were some of the reasons why I used to feel that I belonged nowhere. But then, one day, I realized that not having too fixed roots can be more of a blessing than a curse. Sometimes, when I tell the story of my family, people say that THAT is real globalisation. But I think it’s just today’s reality for a lot of people that have to leave their home country, whether as a result of war or because they are looking for a better life. In my imaginary world, nobody would have to leave their home country against their own will; the conditions all around the globe would be more or less the same, and no one would have to flee from war. I know this is only wishful thinking. Nevertheless, I do believe that each one of us can take little steps and work towards a fairer world. And I am glad I found someone who shares this ideal with me: Irene Hummel, co-founder of the online shop for Fair Trade jewelry and accessories HUMMEL&WOLF (www.hummelundwolf.de). We both believe that we have to be the change we wish to see in the world, to quote Mahatma Gandhi. And through our shop, we bring beautiful and fair-trade products made by artisans and local communities to the German market, thus supporting their local structures and giving them the possibility to earn fair money for their work. P.S. 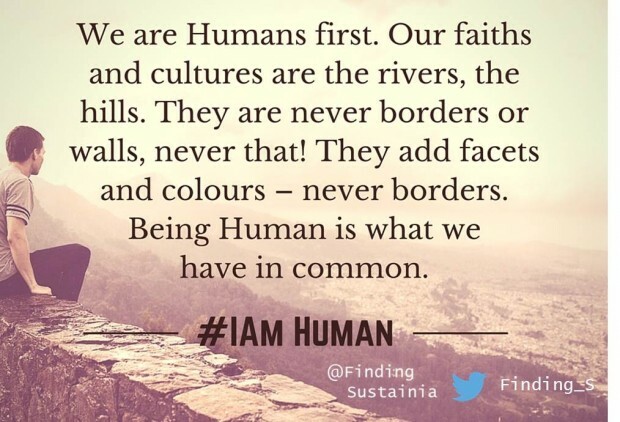 Want to know more about our #IAmHuman campaign and read other Human stories showing that we are different, unique and yet the same? Feel free to comment or tell us your own story in words, or a picture or video! Join us on Facebook “Finding Sustainia“ and stay in touch via Twitter @Finding_S. You may also subscribe to our newsletter (on the right column here on our website). We love to connect!